A slightly irreverent posting. 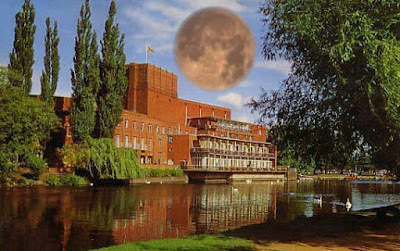 Back in the winter of 1975 whilst studying for English O Level my school arranged a trip to Stratford-upon-Avon to see Henry Vth performed at The Royal Shakespeare Theatre. I enjoyed it immensely. The words in the text that we had been studying sprang to life with actors on a stage. The lines were delivered with passion and also a great deal of humour in places. The play director was Terry Hands and Henry was played by Alan Howard. To show the young king Henry growing in authority and leadership the first scenes were performed in modern dress after which historical attire was worn. At the back of the stage was a large model of a full size cannon behind which one by one the actors would retreat to quickly change attire and then re-emerge in period finery onto the stage. On the evening I attended we had balcony seats over to one side. From where I was sitting I could clearly see Alan Howard's naked posterior sticking out from behind the cannon as he struggled to get into his kingly attire. We schoolboys all cried and shrieked with laughter at the sight of a “full moon” on the stage at the RST.